Why is a rotisserie necessary in a grill, you may ask? We have one of those on the kitchen counter at home! Don't you just close the lid tight and let the radiant heat from the grill move around your meat? Simple, right? Unfortunately, this old-fashioned method just doesn't work for all cuts of meat. Let us tell you about a better way. Direct hot grilling may work well for burgers, smaller, thinner cuts of meat, or vegetables. Due to the time needed to cook a piece through, however, this traditional method can really dry out a nice, thick cut of meat. Constantly opening your grill to turn a roast also lets out lots of heat and flavorful smoke - and may just cook you in the process! This is where a rotisserie device really comes into its own. The slow, regular turning of a roast will guarantee thorough, even cooking while keeping all the juices inside the meat. You'll enjoy a crisp, perfectly cooked outside and tender, extremely moist inside. This method of cooking requires less heat, which also helps keep the grilling area a bit cooler on hot, summer days. To ensure successful cooking, it's important to make sure your meat is well-balanced on the spit. Secure your meat tightly in the center of the skewer. When cooking poultry, make sure wings and legs are well trussed. Before cooking, roll the rod in your hands to make sure there isn't a heavy side, and readjust as necessary. This will ensure even cooking, and put less strain on your motor. A meat thermometer is your friend when cooking thick cuts. Eyeballing it just won't do. Insert into the thickest part of your meat, away from any bones. With an extremely large piece, check the temperature in several areas. Don't poke and prod too often, however, or you may drain too much juice and dry out your meat. Do you need further incentive to add this amazing tool to your grilling arsenal? 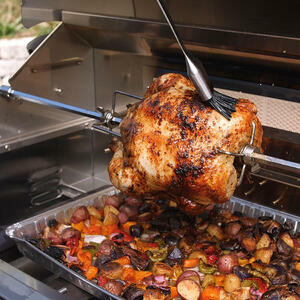 Due to rotisserie cooking's low heat requirement, less fuel is required, and this means savings for you.